Anne Frank, a Jewish girl living with her family in Amsterdam, was thirteen years old during the summer of 1942. At the time, German forces were occupying The Netherlands (also known as Holland). Originally from Frankfurt (Germany), where she was born in 1929, Anne moved to Holland when she was a small girl. Her father - Otto Frank - believed that restrictions on Jewish people in Germany would not bode well for his family. 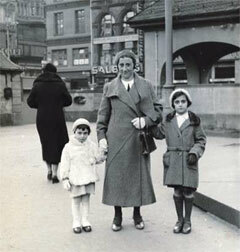 The last picture of Anne in Frankfurt - with her mother (Edith) and older sister (Margot) - was taken on March 10, 1933. Anne was then four years old. Restrictions on Jewish people, put in place by the Nazis, made life very difficult for Anne and all other Jewish people living in Holland. During June of 1942, Anne began to keep a diary. Since she did not have a best friend, Anne planned to confide all her deep thoughts and innermost secrets to her new friend - the diary - whom she addressed as "Kitty." On the 20th of June, 1942, Anne believed everything in her life was as good as could be expected given the circumstances of the occupation. Two weeks later, however, her whole world would be turned upside down. Anne's diary entry - for the 20th of June, 1942 - is read by Carole Bos (creator of Awesome Stories). As you hear the story, the following points may help to guide your thinking. ISSUES AND QUESTIONS TO PONDER: Anne Frank knows that life for Jewish people is difficult in The Netherlands - under the German occupation - but do you think this thirteen-year-old girl could have anticipated all the restrictions which she describes in her diary? How do you think she responded to them? Are those issues part of what she wanted to get off her chest (as she describes it) in writing her diary? If those types of restrictions were suddenly made a part of your life, how would you respond? What do you think happens, to a person, when he/she is expected to give-in to the dictates of a government forcing such restrictions upon one's life? Anne doesn't have a best friend, so she tries to make-up for that by starting a diary she names "Kitty." How would a diary ever take the place of a best friend? Have you ever had a time in your life when writing down your reactions, to bad events, helped to make you feel better about your situation? Describe how writing about it, in your journal, helped you to deal with the problems. "Paper has more patience than people." I thought of this saying on one of those days when I was feeling a little depressed and was sitting at home with my chin in my hands, bored and listless, wondering whether to stay in or go out. I finally stayed where I was, brooding. Yes, paper does have more patience, and since I'm not planning to let anyone else read this stiff-backed notebook grandly referred to as a "diary" unless I should ever find a real friend, it probably won't make a bit of difference. Let me put it more clearly, since no one will believe that a thirteen-year-old girl is completely alone in the world. And I'm not. I have loving parents and a sixteen-year-old sister, and there are about thirty people I can call friends. I have a throng of admirers who can't keep their adoring eyes off me and who sometimes have to resort to using a broken pocket mirror to try and catch a glimpse of me in the classroom. I have a family, loving aunts and a good home. No, on the surface I seem to have everything, except my one true friend. All I think about when I'm with friends is having a good time. I can't bring myself to talk about anything but ordinary everyday things. We don't seem to be able to get any closer, and that's the problem. Maybe it's my fault that we don't confide in each other. In any case, that's just how things are, and unfortunately they're not liable to change. This is why I've started the diary. My father, the most adorable father I've ever seen, didn't marry my mother until he was thirty-six and she was twenty-five. My sister Margot was born in Frankfurt am Main in Germany in 1926. I was born on June 12, 1929. I lived in Frankfurt until I was four. Because we're Jewish, my father immigrated to Holland in 1933, when he became the Managing Director of the Dutch Opekta Company, which manufactures products used in making jam. My mother, Edith Holländer Frank, went with him to Holland in September, while Margot and I were sent to Aachen to stay with our grandmother. Margot went to Holland in December, and I followed in February, when I was plunked down on the table as a birthday present for Margot. Our lives were not without anxiety, since our relatives in Germany were suffering under Hitler’s anti-Jewish laws. After the pogroms in 1938 my two uncles (my mother's brothers) fled Germany, finding safe refuge in North America. My elderly grandmother came to live with us. She was seventy-three years old at the time. After May 1940 the good times were few and far between: first there was the war, then the capitulation and then the arrival of the Germans, which is when the trouble started for the Jews. Our freedom was severely restricted by a series of anti-Jewish decrees: Jews were required to wear a yellow star; Jews were required to turn in their bicycles; Jews were forbidden to use streetcars; Jews were forbidden to ride in cars, even their own; Jews were required to do their shopping between 3 and 5 P.M.; Jews were required to frequent only Jewish-owned barbershops and beauty parlors; Jews were forbidden to be out on the streets between 8 P.M. and 6 A.M.; Jews were forbidden to go to theaters, movies or any other forms of entertainment; Jews were forbidden to go rowing; Jews were forbidden to take part in any athletic activity in public; Jews were forbidden to sit in their gardens or those of their friends after 8 P.M.; Jews were forbidden to visit Christians in their homes. Jews were required to attend Jewish schools, etc. You couldn't do this and you couldn't do that, but life went on. Jacque always said to me, "I don’t dare do anything anymore, 'cause I'm afraid it's not allowed." In the summer of 1941 Grandma got sick and had to have an operation, so my birthday passed with little celebration. In the summer of 1940 we didn't do much for my birthday either, since the fighting had just ended in Holland. Grandma died in January 1942. No one knows how often I think of her and still love her. This birthday celebration in 1942 was intended to make up for the others, and Grandma's candle was lit along with the rest. The four of us are still doing well, and that brings me to the present date of June 20, 1942, and the solemn dedication of my diary. On August 4, 1944, Anne and her family were betrayed by a Dutch informer who gave a tip to the Gestapo. When the Nazis searched Anne's hiding place, she and her family (and the others who were sharing the cramped living space) were found, arrested and then deported to a Nazi concentration camp. The Diary of a Young Girl, entry for the 20th of June, 1942, read by Carole Bos. Copyright for The Diary of a Young Girl, "The Anne Frank - Fonds," Basel, Switzerland, all rights reserved. Excerpt from the diary provided here as fair use for educational purposes and to acquaint new readers with the book. Bos, Carole "Diary of Anne Frank - June 20, 1942" AwesomeStories.com. Oct 07, 2013. Apr 23, 2019.